The endpoint security market is continuously growing as many customers find endpoint security suites to be effective in tackling their top security concerns. But vendors each approach endpoint security in different ways. This report from Forrester looks at the suites and presents the pros and cons of each. The 15 Providers That Matter Most And How They Stack Up. “Symantec offers the most complete endpoint security suite on the market,” according to Forrester Research, Inc. The endpoint security market is continuously growing as many customers find endpoint security suites to be effective in tackling their top security concerns. However, the market is now very fragmented with vendors approaching endpoint security in different ways. Find out why Forrester ranks Symantec a leader in Endpoint Security Suites giving highest possible scores in Threat Intelligence, Vulnerability Remediation, Ancillary Endpoint Security Functions, and Mobile Security. 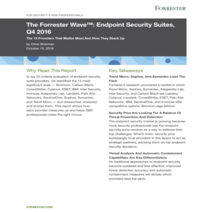 Download a complimentary copy of The Forrester Wave: Endpoint Security Suites, Q4 2016 today.